HF: This article is somewhat rough and ready and is drawn from different sources. If you can add to or correct information provided please contact the Group. Stephen Davies: A WW2 shipyard based in Yau Tong Bay, the Chung Wah Shipbuilding & Engineering Company – started as Hoi Wong Co. Ltd. in 1966 or Chung Wah Shipbuilding & Engineering Co. Ltd in 1962 (sources differ) – became Chung Wah Shipbuilding & Engineering (Holdings) Co. Ltd in 1989 and was dissolved in 2006. Mak Ho Yin has kindly translated the following piece extracted from an article found in one of Ian Wolfe’s Keroseneian articles on flikr linked below in source 1. Ian has given our website permission to use photos and information found on his pages. If you can tell us where the piece was orginally published we would be happy to record this information here. “In 1938, at the age of 14, Wang Huasheng fled to Hong Kong from Dongguan to escape the war. Without a penny, he lived with his uncle Lam Ping and earned a living as a welding apprentice at the Hong Kong & Whampoa Dock. He became a skilled welder in two years. In 1941, at only 17, he borrowed $400 from his aunt and set up Chung Wah Welding and Steel Works at Ap Liu Street, which was to become Chung Wah Shipbuilding & Engineering Company. Going back to his home town during the period of the Japanese Occupation in Hong Kong, he returned after Japan surrendered in 1945 and reopened the shop at Prince Edward Road, undertaking shipbuilding and shipbreaking works, with his business prospering. In 1961, he purchased with partners a land lot of 120,000 square feet at Cha Kwo Ling Road, Yau Tong, and established a shipyard. Two years later he bought the partner’s share and combined the shipyard with a welding works to form Chung Wah Shipbuilding Group and Chung Wah Construction & Structural Engineering Company. 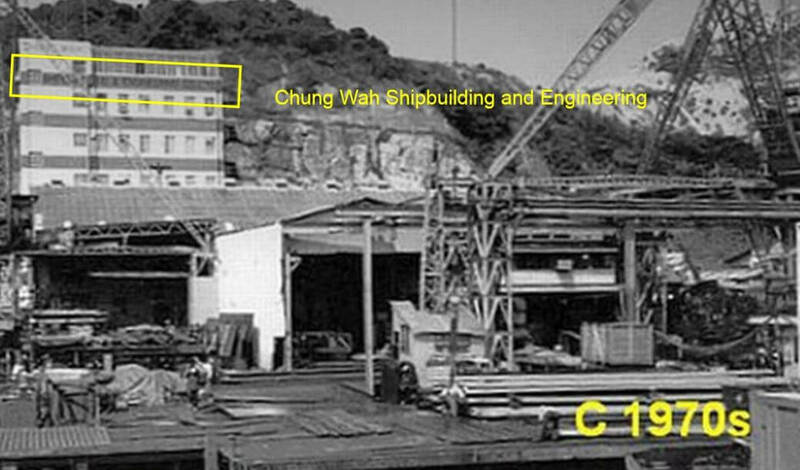 Chung Wah Shipbuilding was listed in 1973, with a capital of HK$13m and about 200 to 300 employees, specializing in shipbuilding and steel structure buildings. With its sizeable area, Chung Wah Shipbuilding had sufficient space to handle the construction of barges. At that time his son Wong Man Kong completed the ship design course at the California University in the USA, and after returning to HK started to design ships for the marine police. He also built the world’s fourth largest working vessel, which had a function comparable with the rescue ships in the Polar areas. The ship was later requisitioned by the British government during the war. The Chung Wah Construction & Structural Engineering Company also undertook the steel structure work of the Far East Finance Centre, Hong Kong, the Macau Ferry Terminal, Shun Tak Centre, HSBC Building, Overseas Union Bank Centre in Singapore and Times Square in Hong Kong, as well as the electrical engineering works of the Tai Po Towngas plant and the Castle Peak Power Plant. Furthermore it also participated in the construction of the second cross harbour tunnel and the new Bank of China building. Ian Wolfe wrote in the above-mentioned article posted in 2013 regarding plot T.M.L 41-43 and the redevelopment of Yau Tong Bay: The plot was acquired by Wong Wah Sang and partners in the 60s for ship building – the Chung Wah Shipbuilding & Engineering Co., Ltd.
Two slipways, one at each side of the plot, still existed in the 70s and 80s when active ship repair was underway. In 1988, the yard in front of workshops was still covered with ship repair equipment, steel structures, ships under repair and cranes. Yet by the early 90s, the structures and crane had been removed, leaving behind the main workshop and repair activities of the yard; the slipway to the west of the plot had been already reclaimed. By the end of 1998, the original buildings and workshop established by the shipyard had been completely demolished. This article was first posted on October 11th 2016.